Crows ate our dinner before we cooked it over the campfire one night. Fog covered many viewpoints along California’s majestic coast. And our packed itinerary had to be scaled back considerably. But these few setbacks couldn’t ruin our four-day road trip up the Pacific Coast Highway, which offered stops for bakeries, wildlife and postcard-worthy photos. One of the few benefits of my boyfriend, Tom, relocating to San Diego is the chance to visit the West Coast. We explored much of the city on my last visit, but this time, we wanted to see more of the grand state. 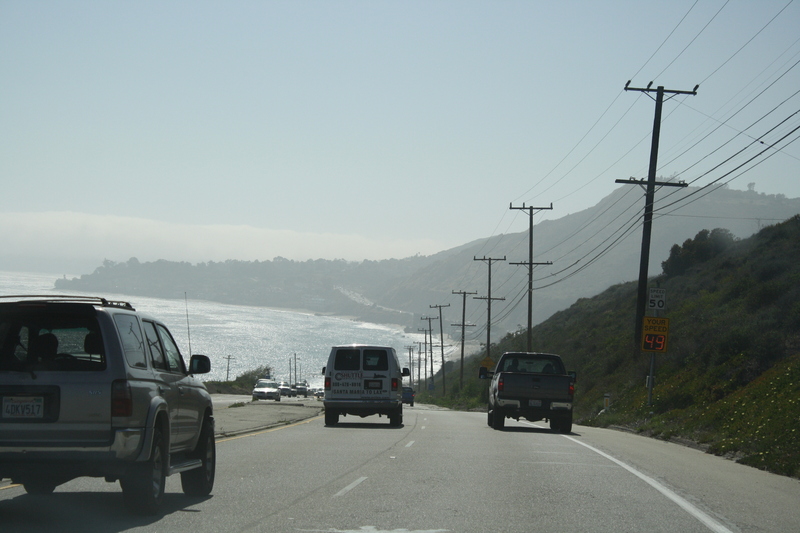 Driving the Pacific Coast Highway in the Avalon. Spending four days in a Toyota Avalon could be rough on a relationship, I had imagined. But with so much we wanted to see and do along the coast, boredom never set in. 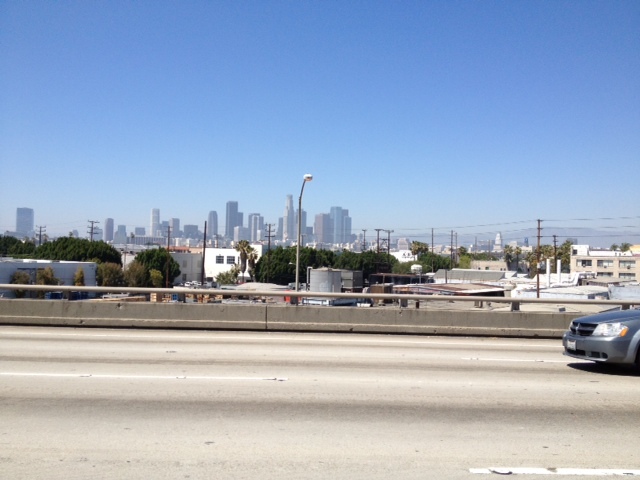 We left San Diego mid-morning Friday, hoping to avoid most of the traffic in Los Angeles. Of course, our first stop ended up being just an hour away, at Mission San Juan Capistrano. Our schedule was already falling behind.The 1776 Spanish mission, filled with colorful flowers but none of the swallows it’s known for, is one of 21 along the coast. Mission San Juan Capistrano offers gorgeous flowers – and lots of school children. We only made it to one other on our trip back south, Mission Santa Barbara, but I bet an ambitious traveler could plan a route with stops at many more. Especially with more time. After spotting the famous Hollywood sign on a distant mountain in LA, we picked up the Pacific Coast Highway, Highway 1, at the foggy beach in Santa Monica. That’s when Tom stated to worry about the sky for the rest of our trip. Coastal California can often be plagued with marine layer rising up from the water, then mixing with fog inland. 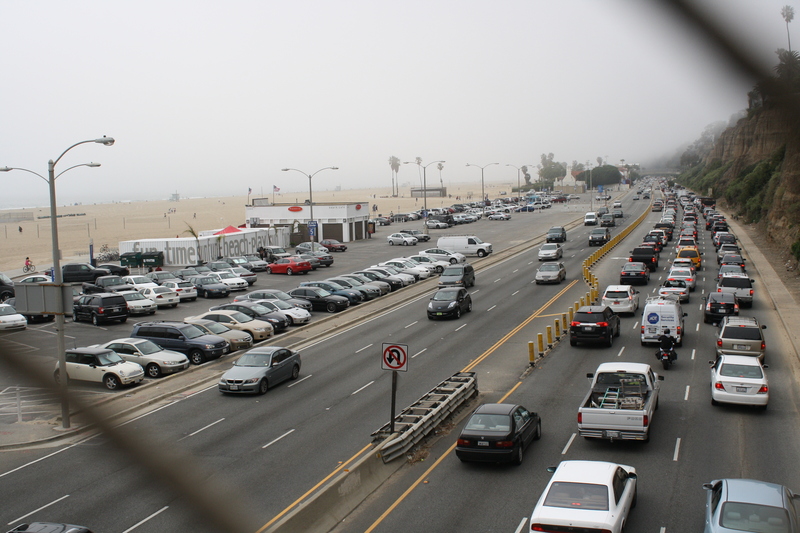 We picked up Highway 1 at Santa Monica. We were fortunate that no rain fell during our trip (except when crossing one mountain), but cloudy skies and foggy air did block many spectacular views we had hoped to see. Most of our Day 1 stops had to be pushed back for our return trip. 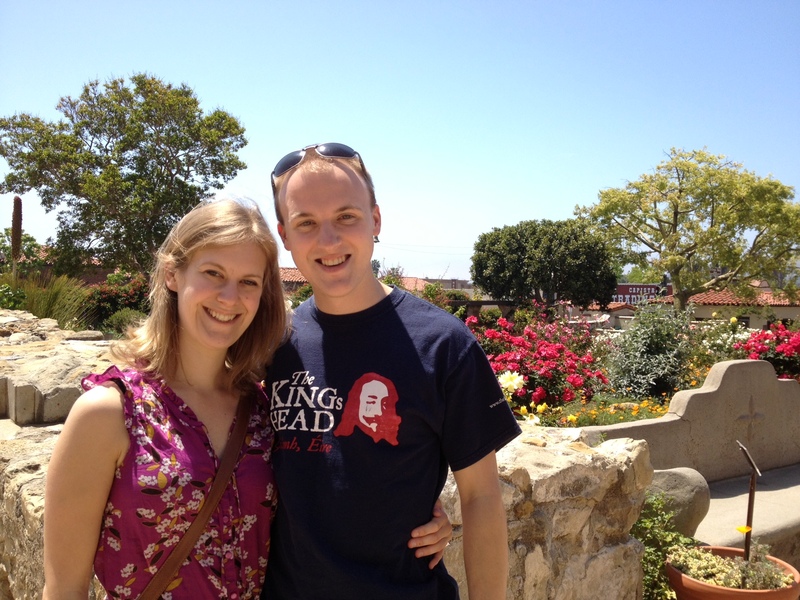 We had hoped to see Santa Barbara and a winery—but went Monday instead. 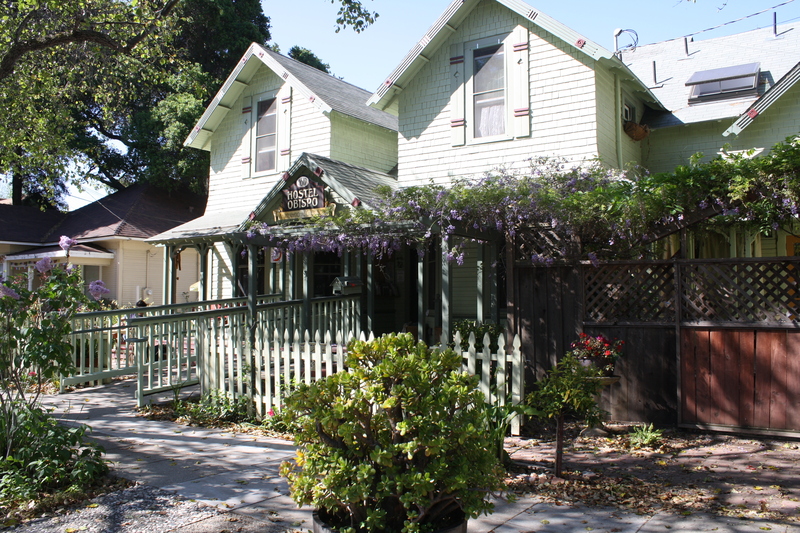 Time got away from us as we headed to a hostel in San Luis Obispo, mid-coast. Right before the sun started to set that evening though, we did pass by a beach I had hoped we could visit. 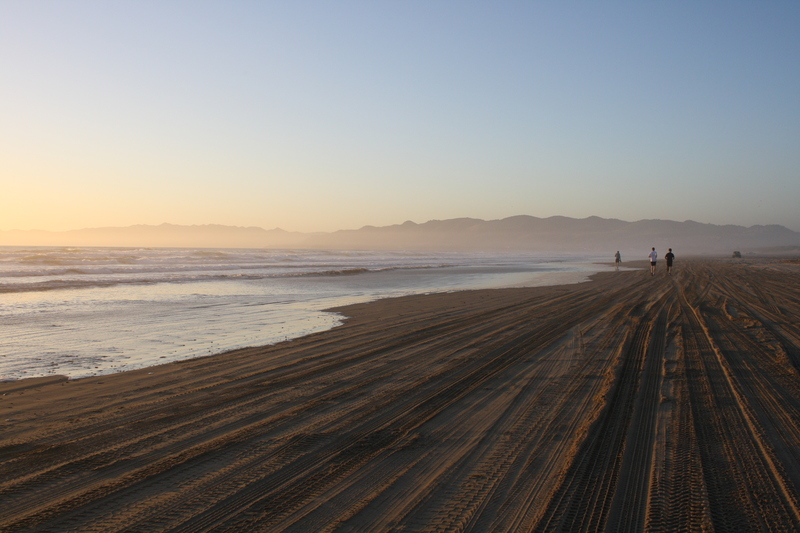 At Pismo Beach, you can pay a small fee to drive your car right onto the beach. Pinching pennies, we simply walked on to the sand. We wished we could have built a bonfire like other beachgoers, because the temperature quickly dropped. Pismo Beach, where cars can drive on the sand. I was so glad that I had an iPhone during this trip (except in Big Sur where there was absolutely no service available), because it meant we could constantly look up addresses and routes, since not everything was planned ahead of time. We found a restaurant downtown in the college town, serving up delicious foods, including swordfish tacos and a huge veggie plate. Driving wore us out though, so instead of going out to one of the popular bars or local brewery, we were ready to sleep.